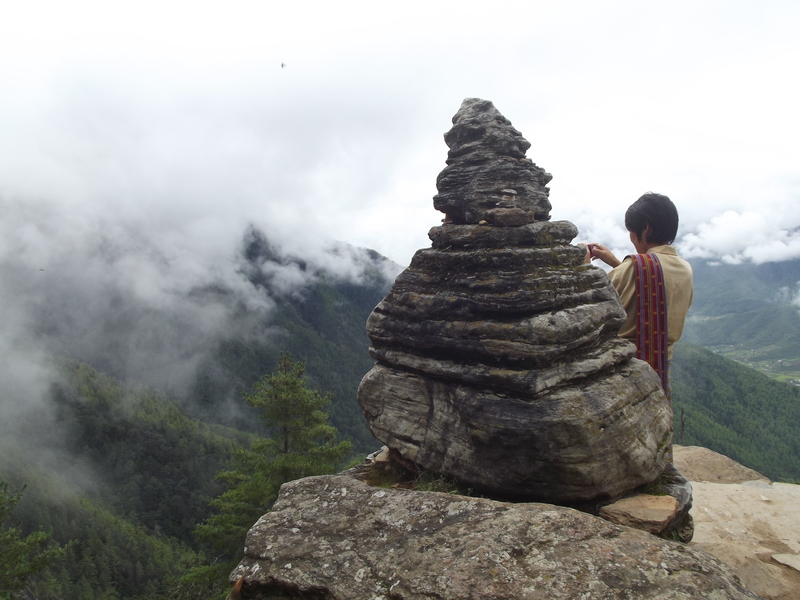 And so I woke up and it was the morning of my last full day in Bhutan. My flight back to Kathmandu left at 8am the next day, so I had to be at the airport at 6am. 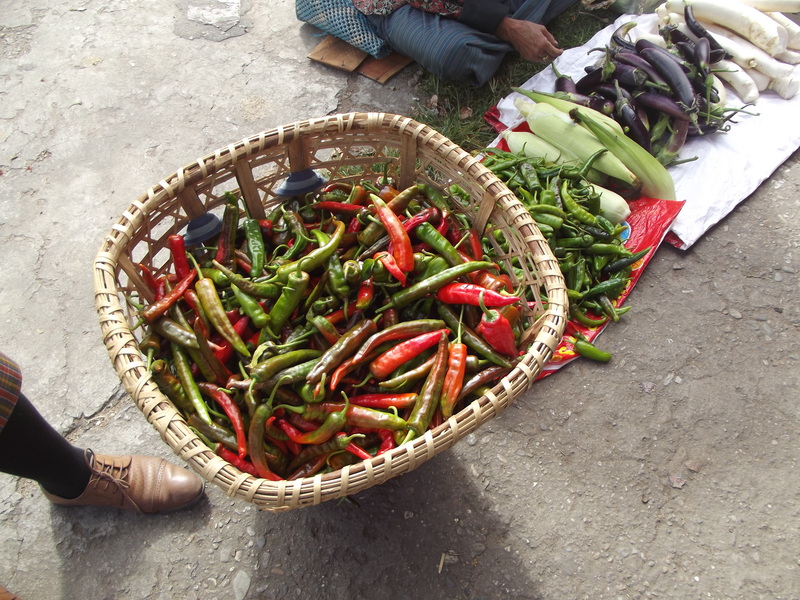 At least I would be back in Kathmandu for breakfast! My final day was the most enjoyable of all. I love hiking, and combine that with climbing 900 metres up a rather large hill to see an amazing building, and I’m happy. 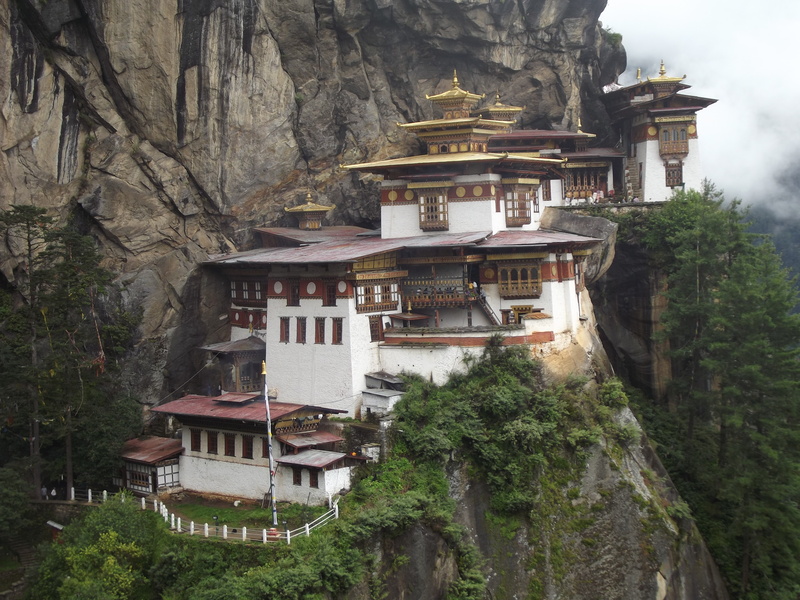 Taktshang Geomba (Tiger’s Nest Monastery) graces all the travel books and publications about Bhutan. 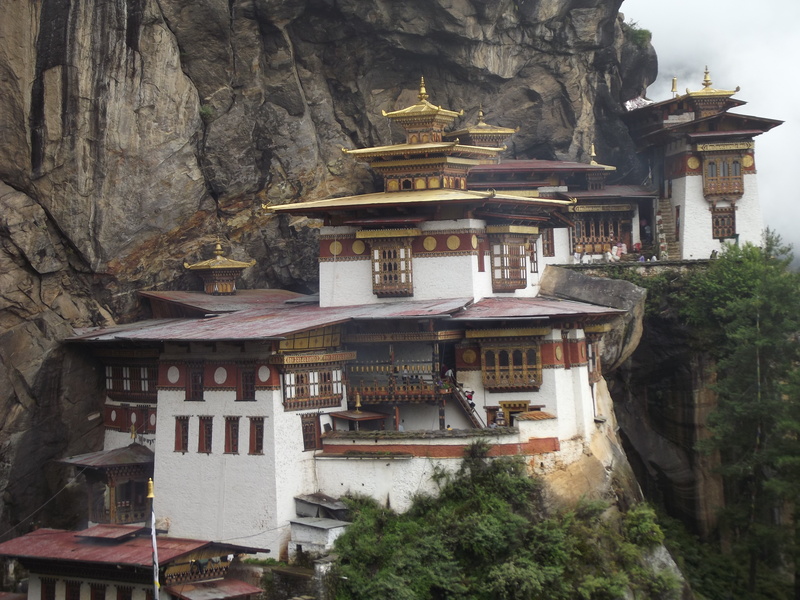 Go to any travel show and I guarantee that the Bhutan agents will have at least one picture of this iconic place, maybe a few from different angles. It certainly is incredibly photogenic, and as you can get under it, above it, next to it, and in it, there are plenty of opportunities for taking great photos. 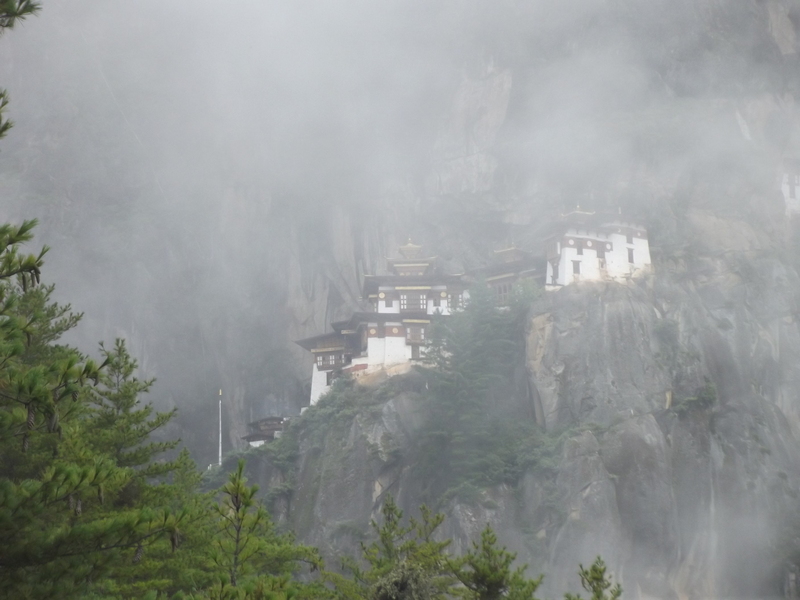 Tiger’s Nest monastery is somehow clinging on to a cliff 900 metres above the Paro valley. 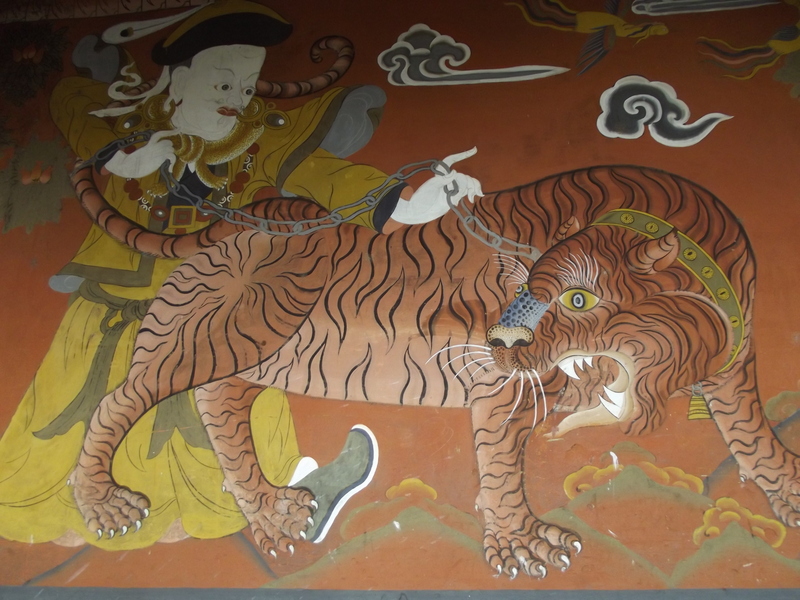 Guru Rinpoche was lucky – he flew up here on the back of a tiger to do battle with a demon. I walked. Once he got here he had a nice sit down and meditated for three months. I was there for about an hour and a half and didn’t stop looking at things – it is a magical place. You leave all your technology at the door (no cameras, no phones, no video cameras) and make sure that your arms are covered (I had to borrow a jacket from one of the receptionists at the hotel. It was so lovely that I was tempted to nick it :)). I’m pretty fit so I was bounding up the first bit, passing another couple of people who had also left their hotel sensibly early. Then I realised that we were climbing quite steadily and I slowed down. 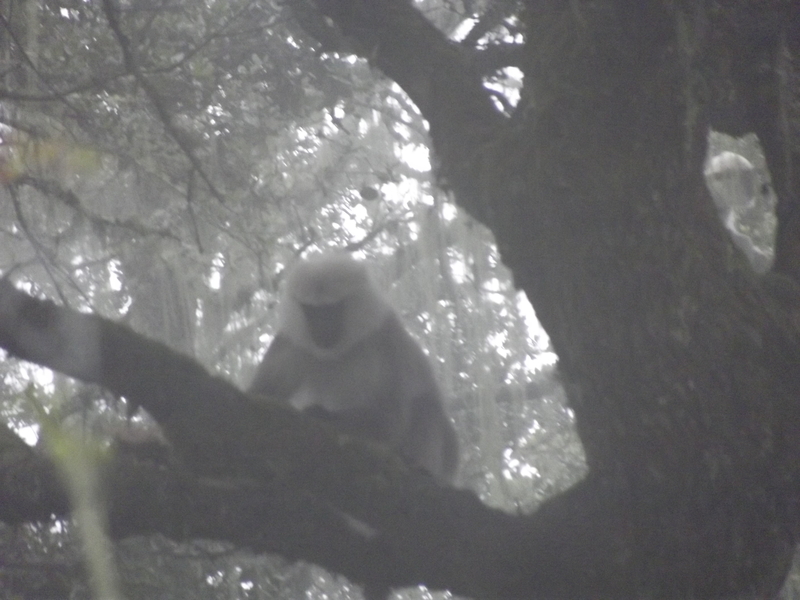 We walked through beautiful forest, saw sunbirds and disturbed some grey langurs, who leapt up, staring at us. We were passed by one group of blokes from the Indian Army who rather annoyingly had their mobile phones playing tinny Bollywood hits. We let them get far ahead of us and then continued. 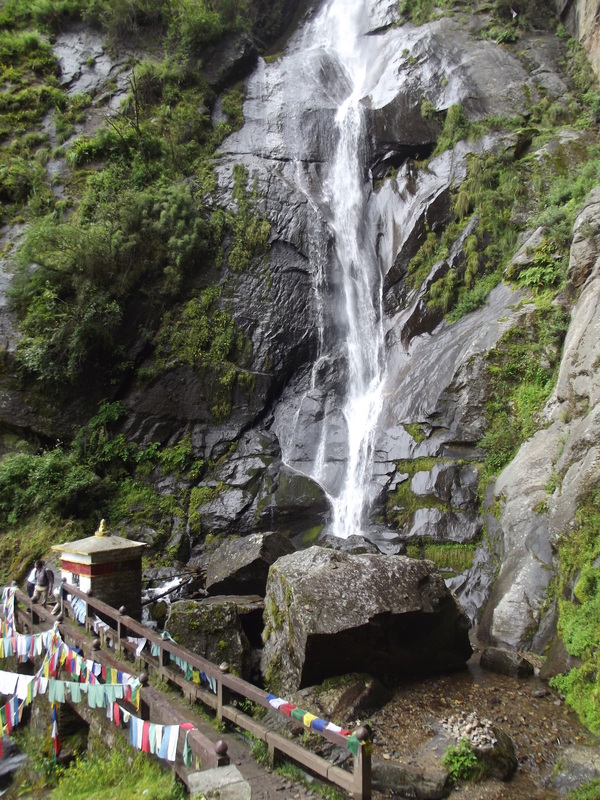 After just over an hour we were standing looking at the monastery close up, with the waterfall at our backs. 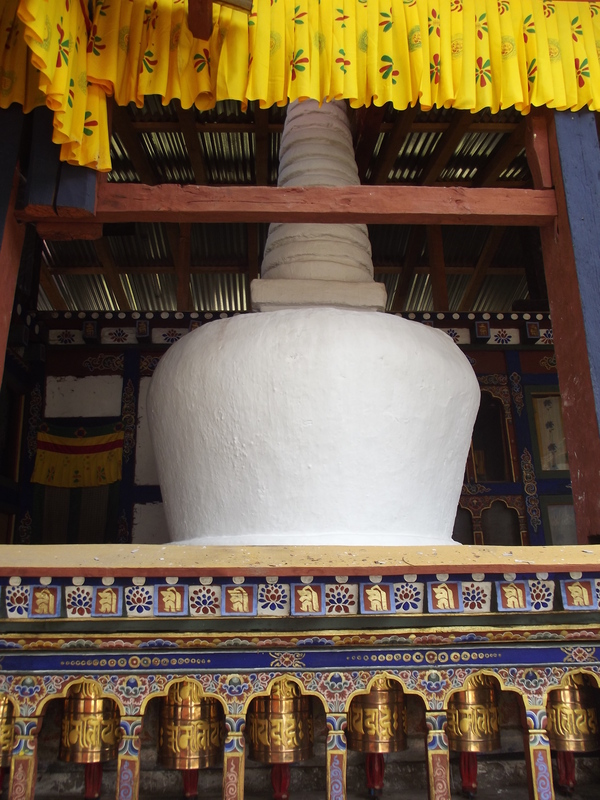 This powers the prayer wheel at the bottom so it never stops turning and prayers are constantly flying off into the sky. Once we got to the monastery there was a great feeling of camaraderie, as people struggled down across the bridge and then up the other side. 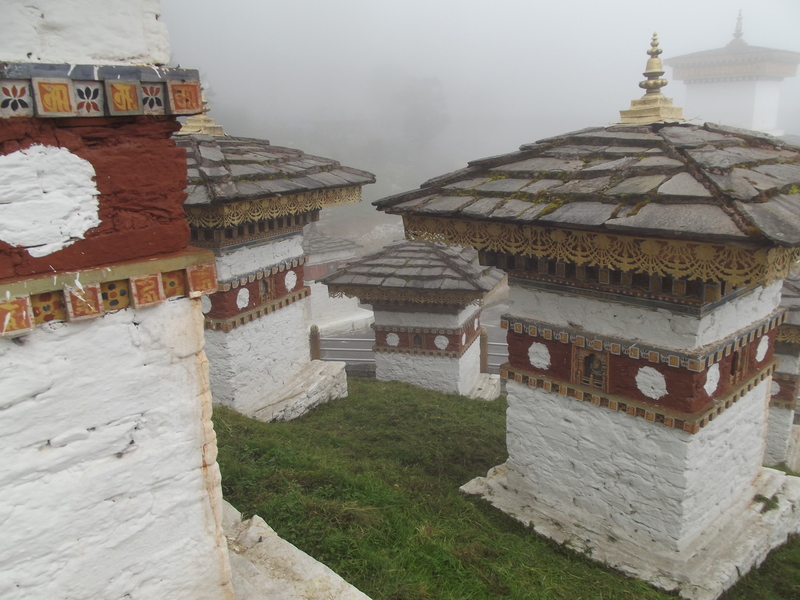 First up was where Guru Rinpoche meditated for three months after he flew in on the tiger. The cave itself is hidden behind a gilded door and seldom opened. Today it was shut but the murals more than made up for that. I have a thing about these wall paintings and there were plenty of them to look at all painted in beautiful, vivid colours. 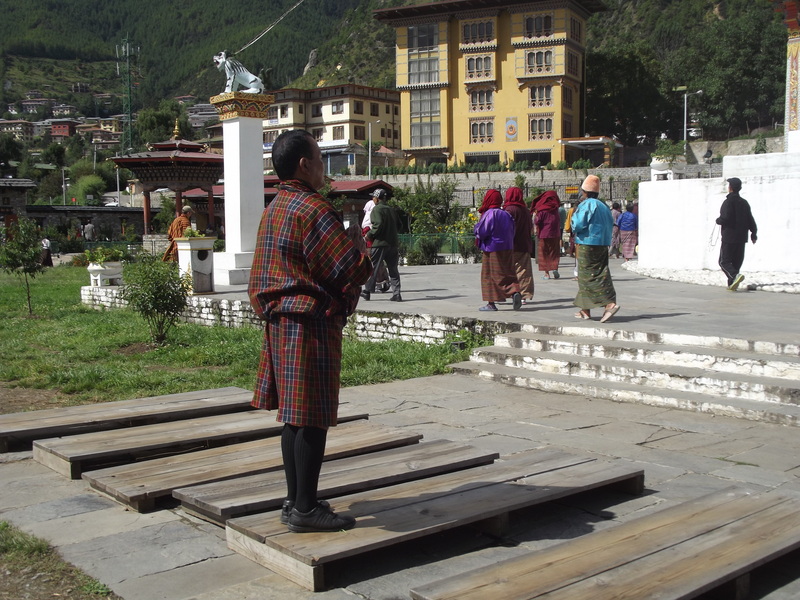 There were a few Buddhist pilgrims worshipping, praying, chanting and bringing offerings for the monks (mostly bags of crisps and packets of biscuits. I hope their normal diet is healthy!). Despite being 100% atheist I did appreciate the spirituality of the place and I could easily have taken some of the murals home with pleasure. How on earth the monastery clings on to the side of the cliff I have no idea, but it does. It almost looks like an organic growth. Going down the mountain was quicker, even being careful of knees and ankles. 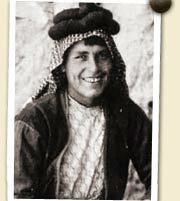 We stopped for a cup of tea and a biscuit or two at the cafeteria and carried on back down. What an absolutely amazing place. 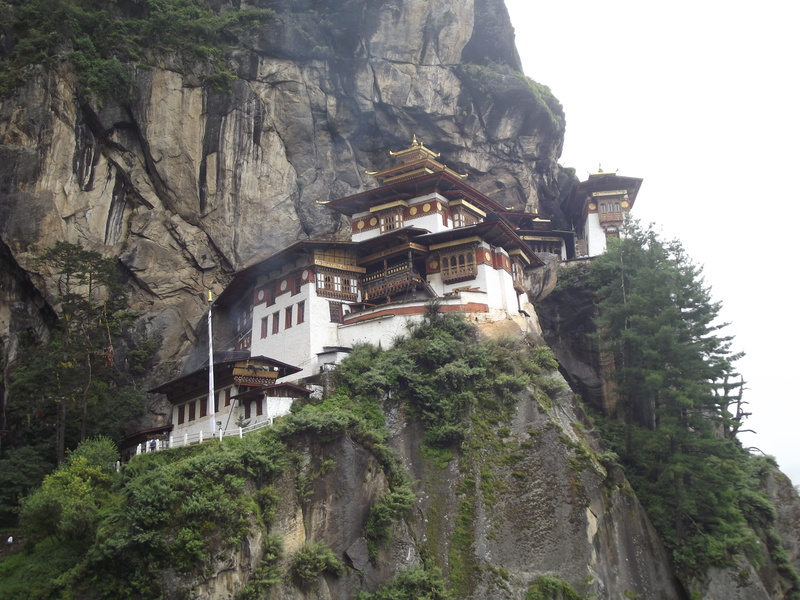 I don’t think a trip to Bhutan would be complete without a visit to the Tiger’s Nest monastery. 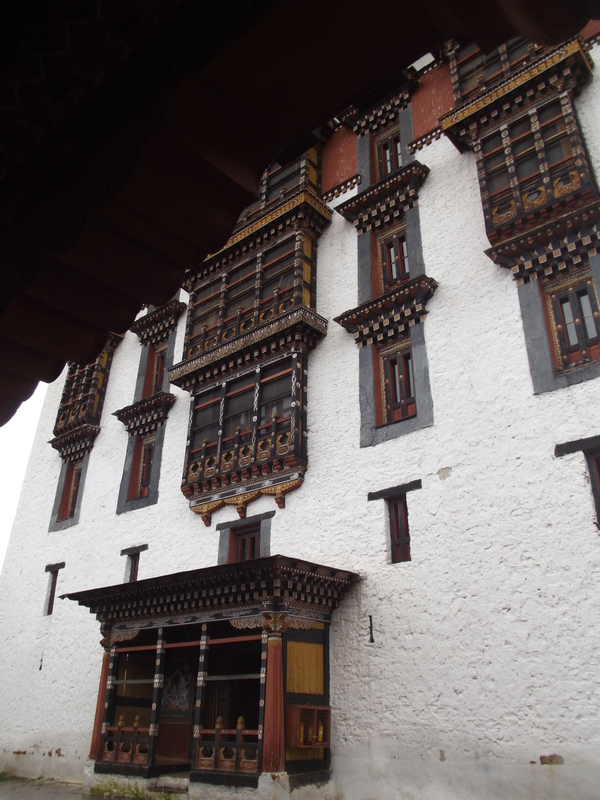 After another enormous lunch (they feed you a LOT in Bhutan) we went off to see our last sight, the Rinpung Dzong. As it was raining we had the entire place to ourselves, with the exception of one very grumpy young monk, who was manning the charm stall. You can buy a charm to protect you from most things you can think of. Rain wasn’t one of them though. 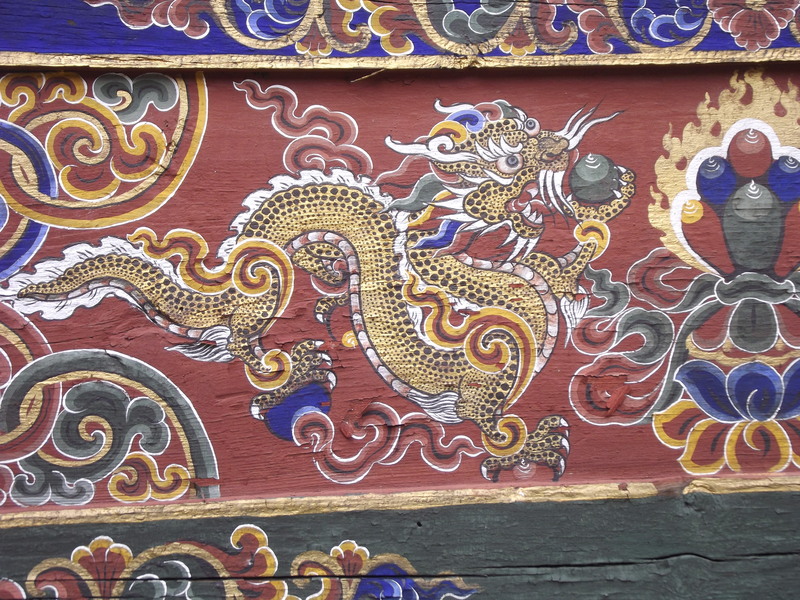 The building itself was beautiful, with more of the exquisite wood carving that adorns a lot of the buildings in Bhutan. 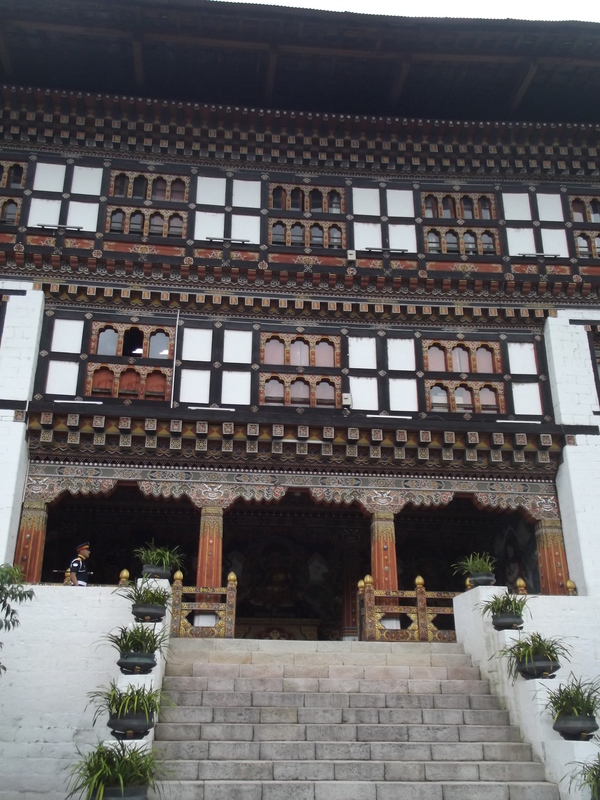 The dzong was damaged by a fire in 1907, and when the ashes were investigated the massive thangka that is unfurled once a year in the courtyard was found untouched. The murals here are beautifully fresh and vibrant. 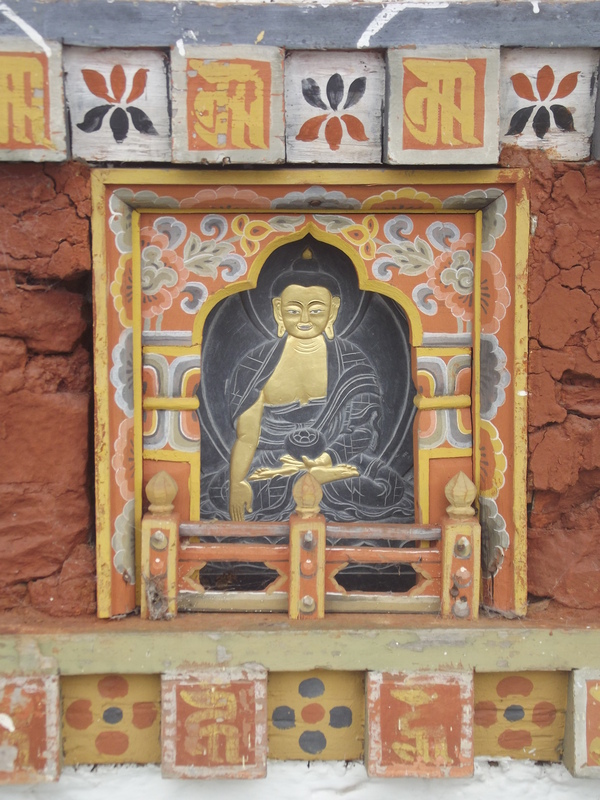 Some tell the life of Milarepa, the Tibetan saint. Again, these could cheerfully have come home with me, but it wasn’t to be. 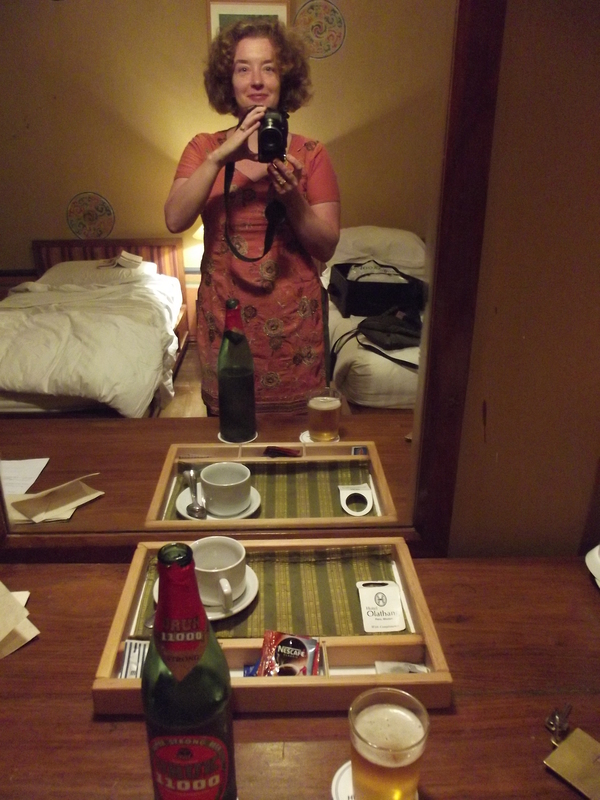 Thankfully I’d asked for an alarm call for my first morning in Thimphu as the bed was so comfortable and everything was so quiet that I could easily have gone on sleeping. 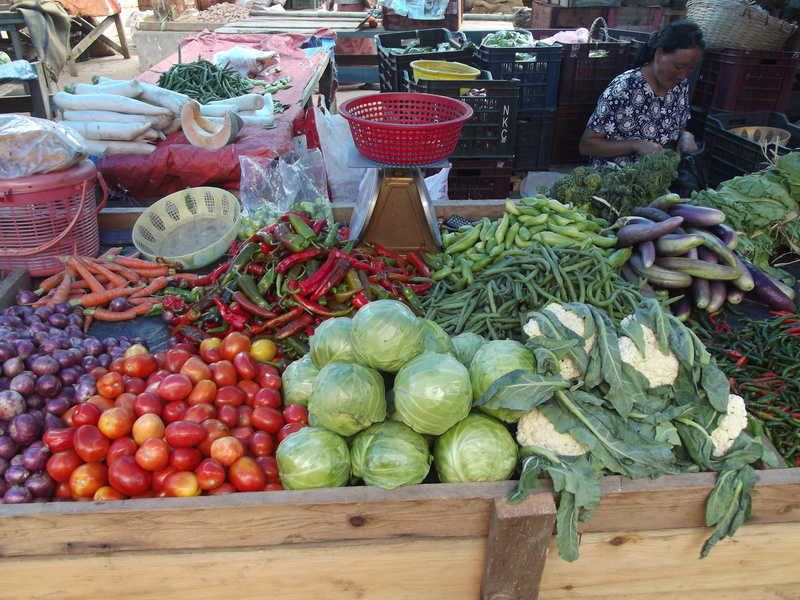 The contrast with Nepal is striking. 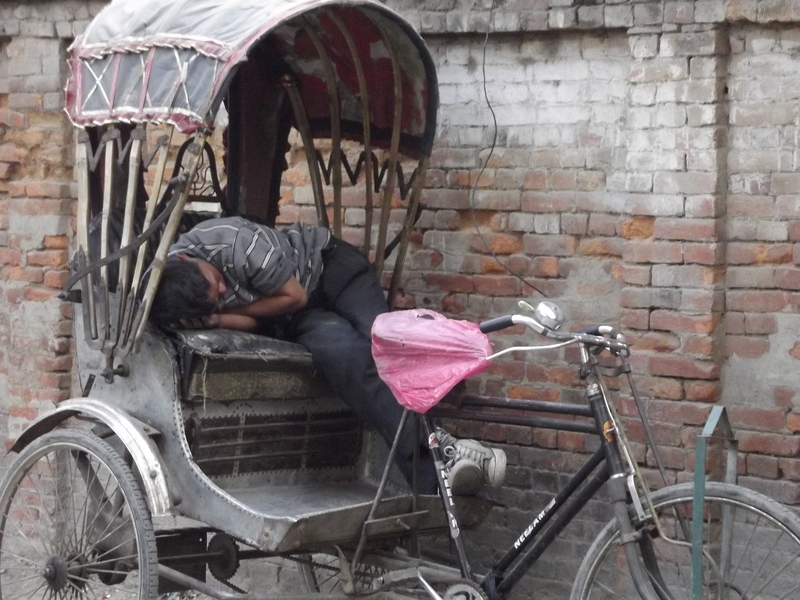 I’m so used to waking up in Kathmandu at about 5am to the dawn chorus of motorbikes revving, taxis honking, dogs barking, pigeons cooing, people chattering away, shutters going up, bells ringing for puja etc etc. 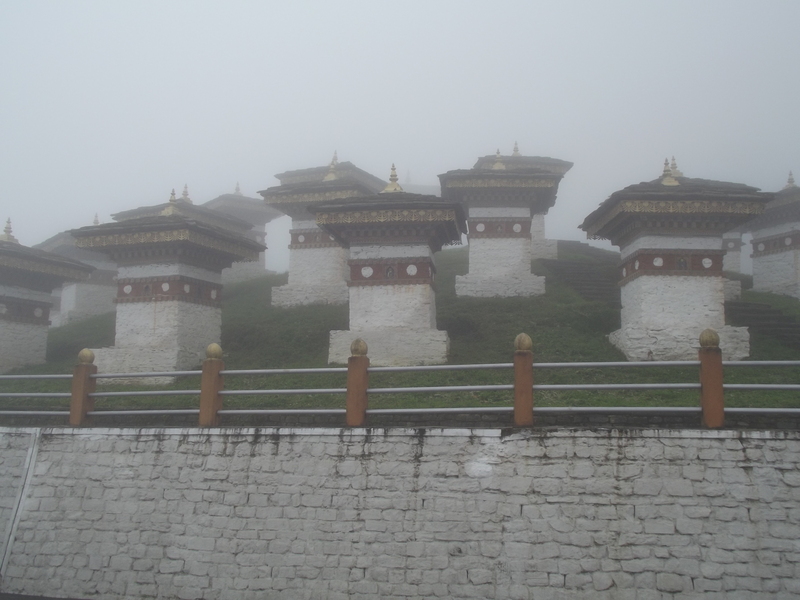 Thimphu was the total opposite. 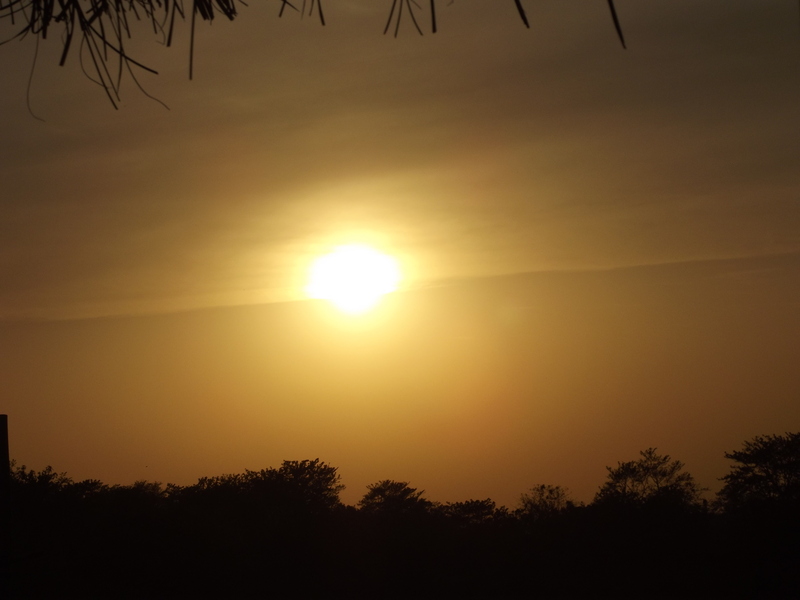 The only sound was the chirping of the birds who had made their nest above my window. At breakfast I shocked the staff with my prodigious English tea-drinking ability. In the end they just gave up and brought the whole pot over 🙂 By 7.45 there was still nobody around, the clouds had begun to lift and the sun was streaming down onto the square. 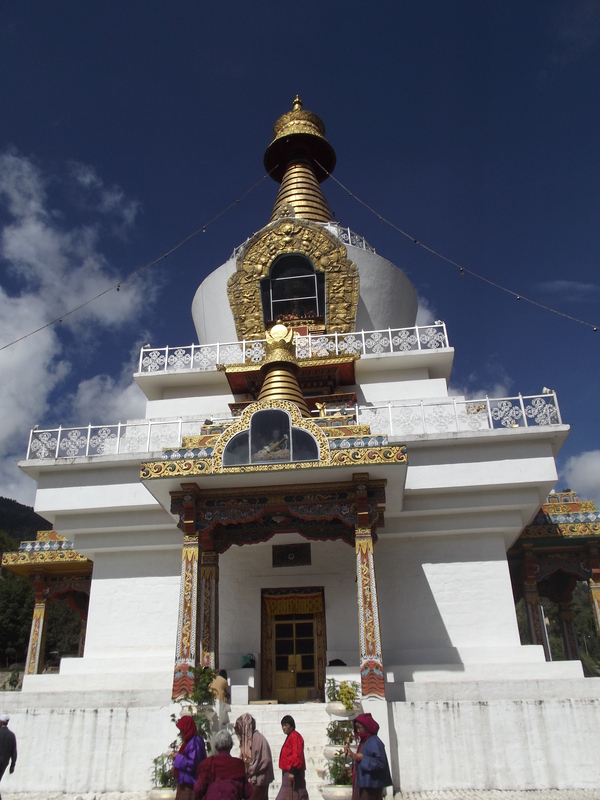 After breakfast our first stop was the memorial chorten built in honour of the third king of Bhutan, Jigme Dorje Wangchuck. 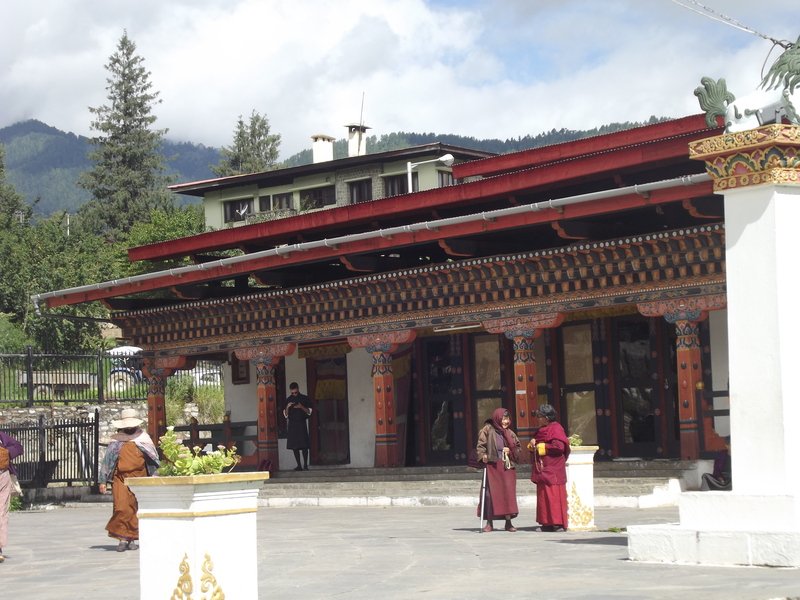 The nice thing here was that it wasn’t just a sight, it was also obviously well used by local Bhutanese people, including those doing their prostrations first thing in the morning. 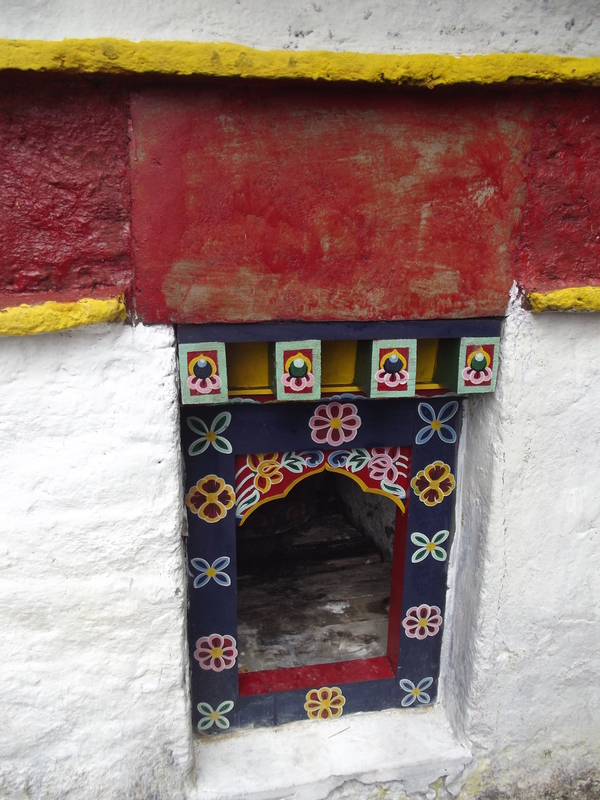 I had seen this in Lhasa too. 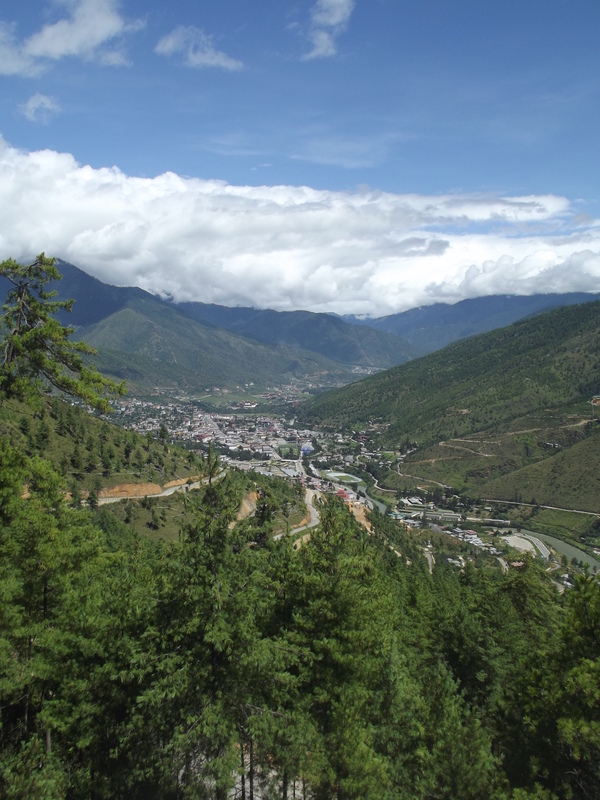 Some people do it for miles and miles, and in fact when we were on the road from Thimphu to Paro later in the trip I did actually see a man on the main road lying flat out, getting up again, moving slightly forward, and repeating the whole thing. It must take months to get anywhere. 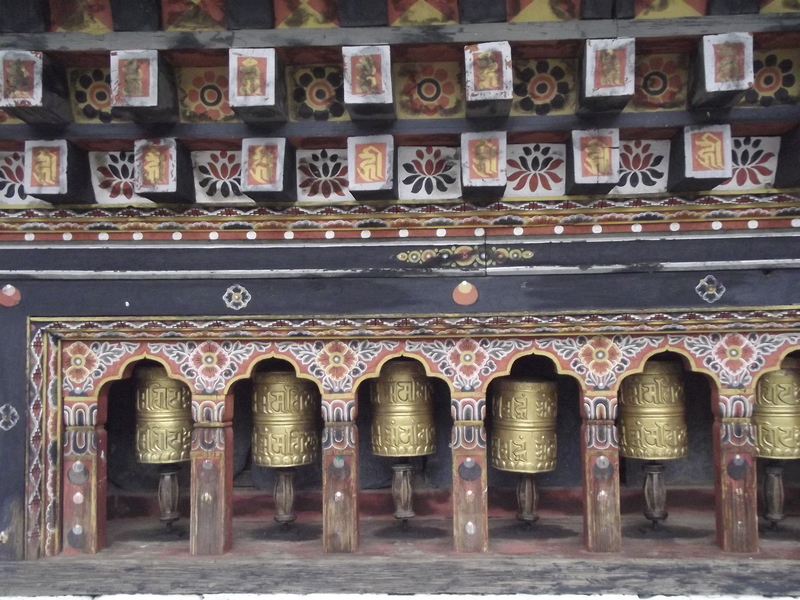 Most people here were spinning the prayer wheels on the way to work or school, and it was a peaceful place to start the day. 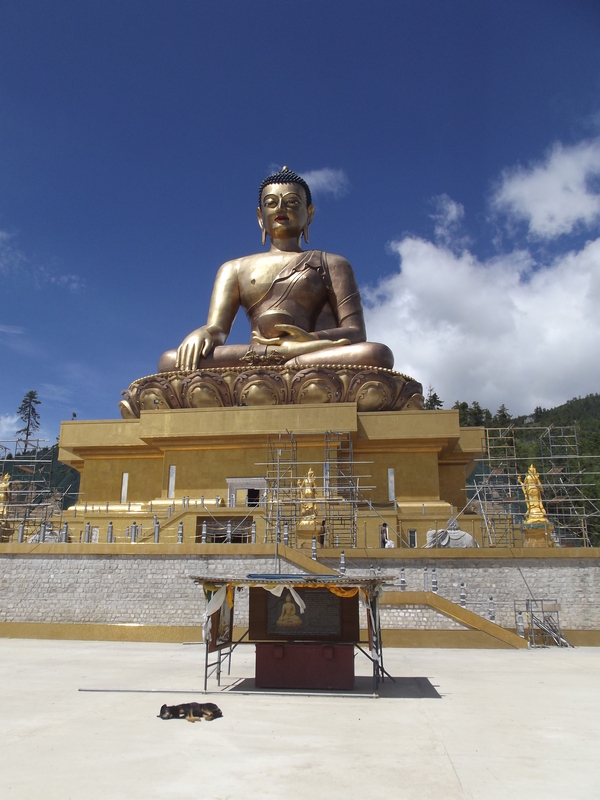 From here we drove up, up, up the windy road to visit the Buddha Dordenma, an absolutely enormous (51 metre tall) statue of the Buddha, which overlooks the Thimphu valley (and has great views). 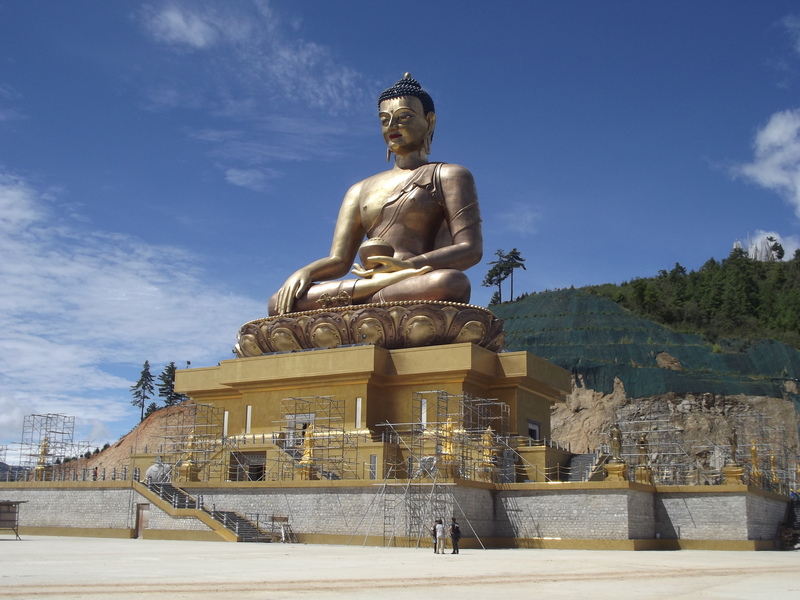 Many people from around the world have donated money to help finish the Buddha, which is still being constructed. 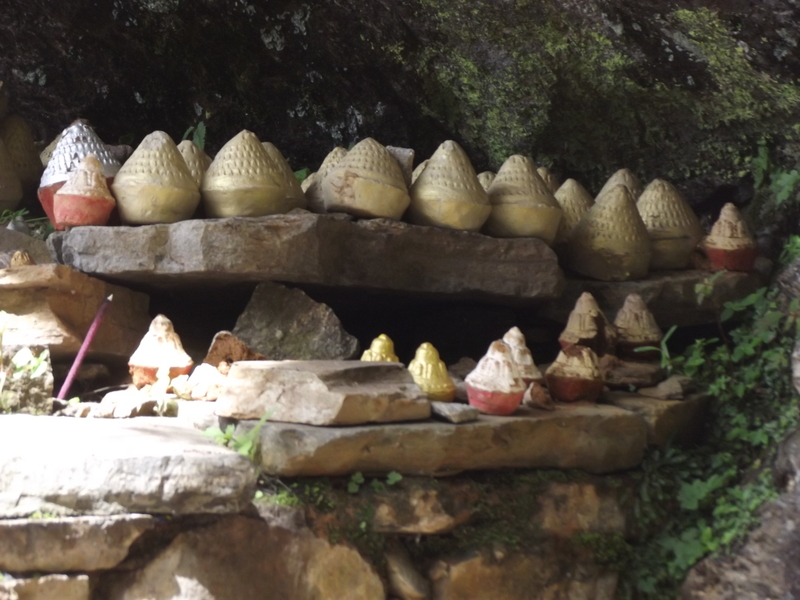 Once finished it will contain thousands of smaller Buddha statues. An amazing thing to see standing guard over the valley. As I’m interested in crafts my tour included a lot of visits to craft workers. 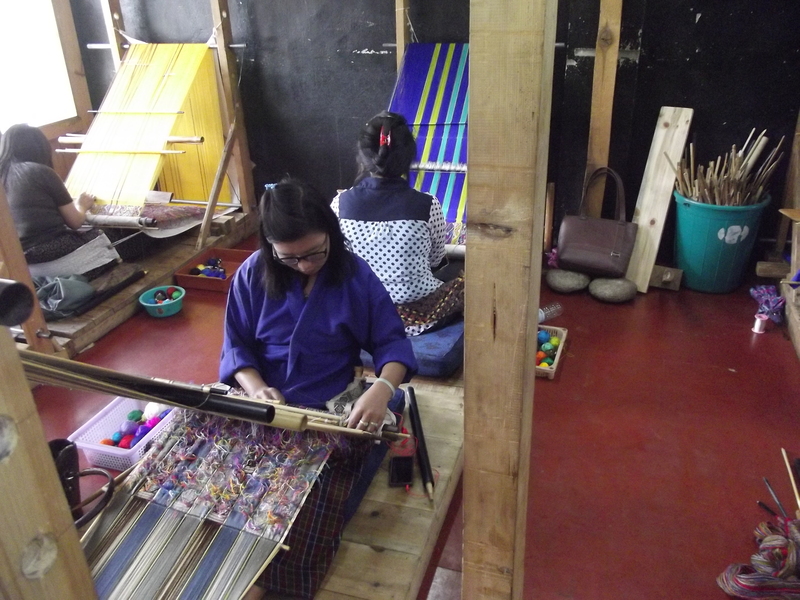 Our next stop was the Gagyel Lhundrup Weaving Centre at Changzamtog, just outside Thimphu. 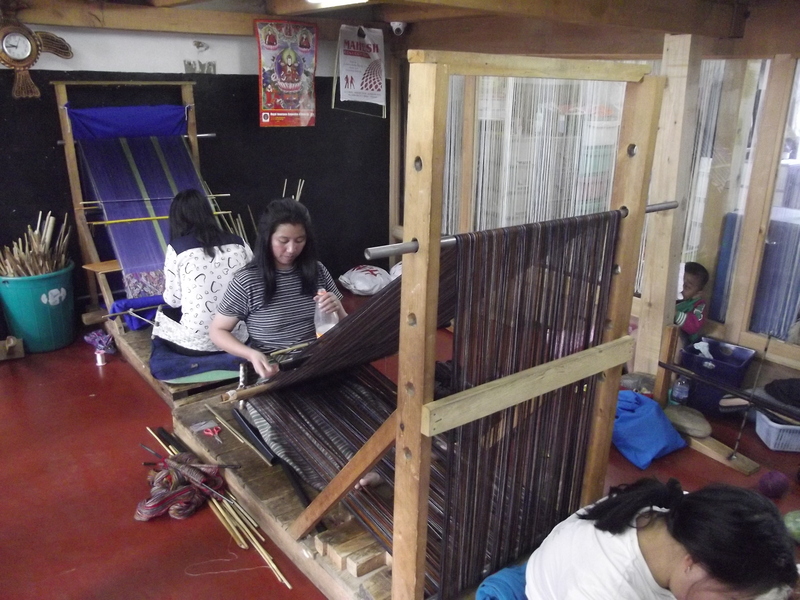 I was lucky enough to see some of the women weaving beautiful fabrics, which are for sale upstairs in the shop. I managed to restrict myself to just one silk scarf that has the most amazing colours. Many Bhutanese women have looms at home and spend time every day weaving; in fact I saw this myself on the drives through the country. 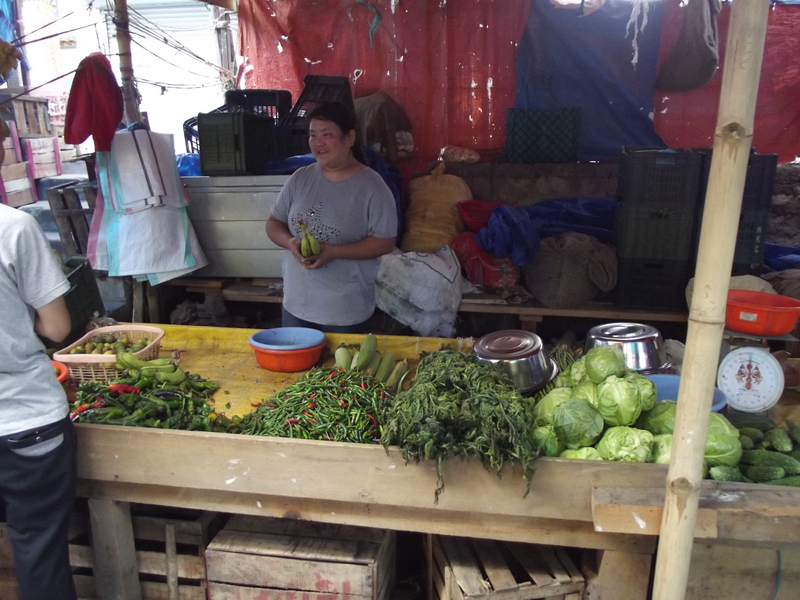 The houses have wide verandahs that can accomodate a back-strap loom and a pile of fabric ready for sale. 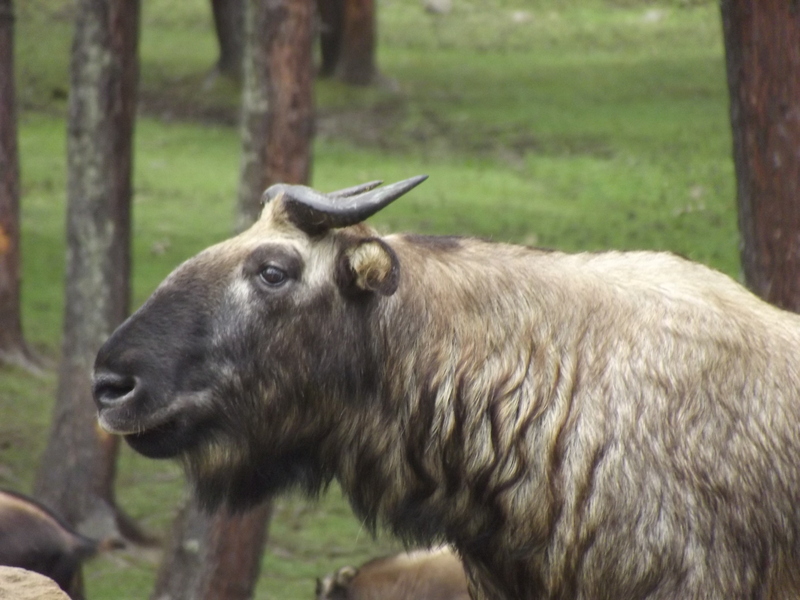 If you’ve been following the blog for a while you’ll know how keen I was to see takins, the national animal of Bhutan. 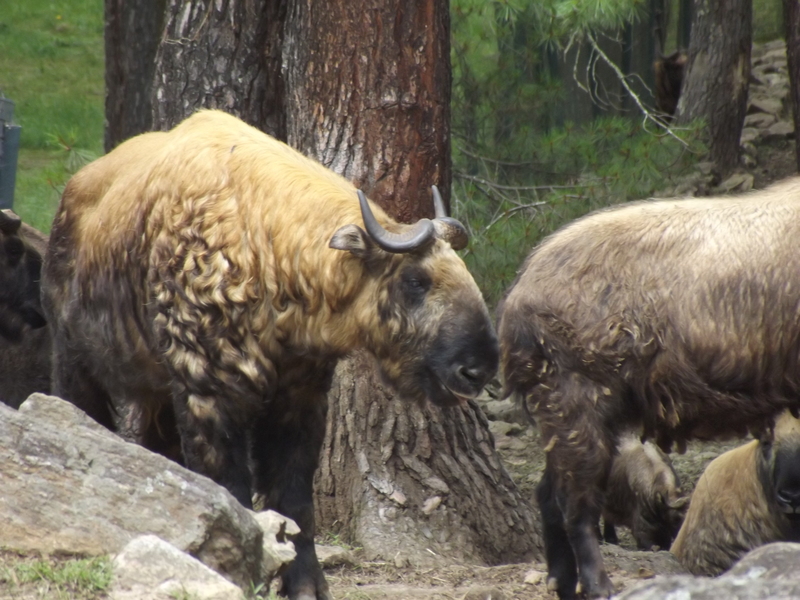 You’re unlikely to see them in the wild unless you’re super-lucky, so I tromped off to the Motithang takin preserve which houses a few of these amazing animals. The fourth king was not happy that animals were being kept in an enclosure (I guess it’s not good for their gross national happiness!) so they were released into the wild. 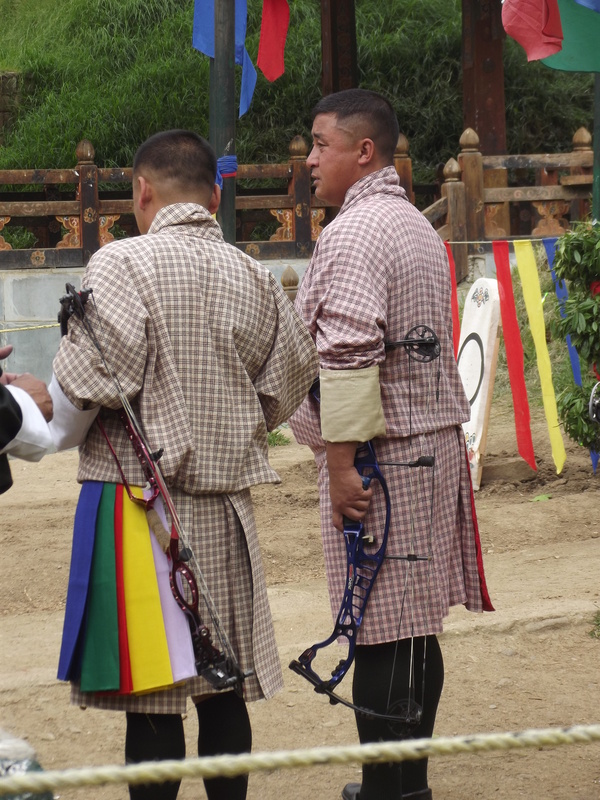 However, as they were so tame they ended up strolling round Thimphu in search of a meal, so they were put back into captivity. I was lucky to see them close up, as one of the takins was unwell and was being treated, so they were all close up to the fence. 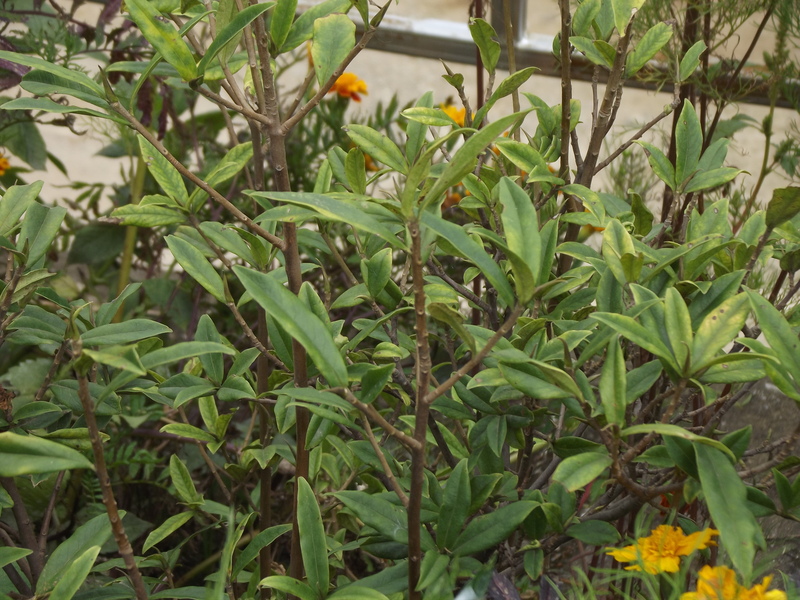 They are rather odd-looking but I have a soft spot for anything like that, so I really enjoyed visiting them. 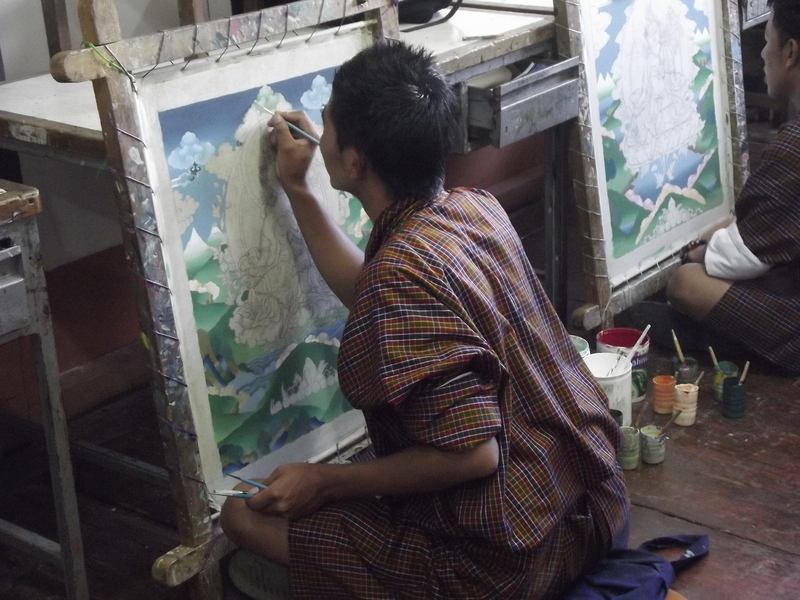 The Bhutanese have 13 traditional arts and crafts (Zorig Chusum), including carving, painting, weaving, embroidery and paper making. 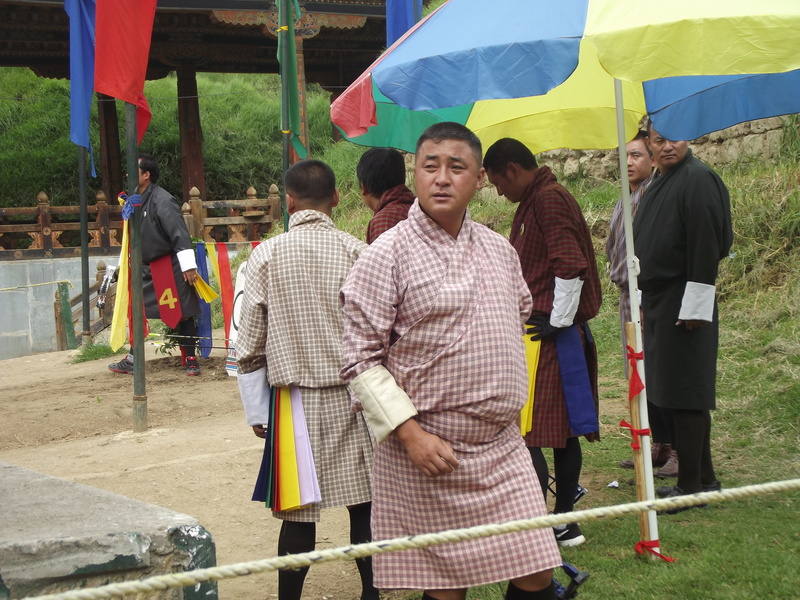 I was excited at being able to visit the National Institute for Zorig Chusum in Thimphu and watch some of the students learning their trades. I felt slightly uncomfortable at first, as I was worried about disturbing the hard work going on, but none of the students batted an eyelid. They must be used to tourists sticking zoom lenses into their faces and just got on with what they were doing. They have a shop onsite where you can buy pieces that the students have made. Touchingly the students write their names on the back of whatever it is that they’ve made so I now have a beautiful piece of embroidery made by a student called Dawa Choden (thank you Dawa!). A paper factory was my next stop. 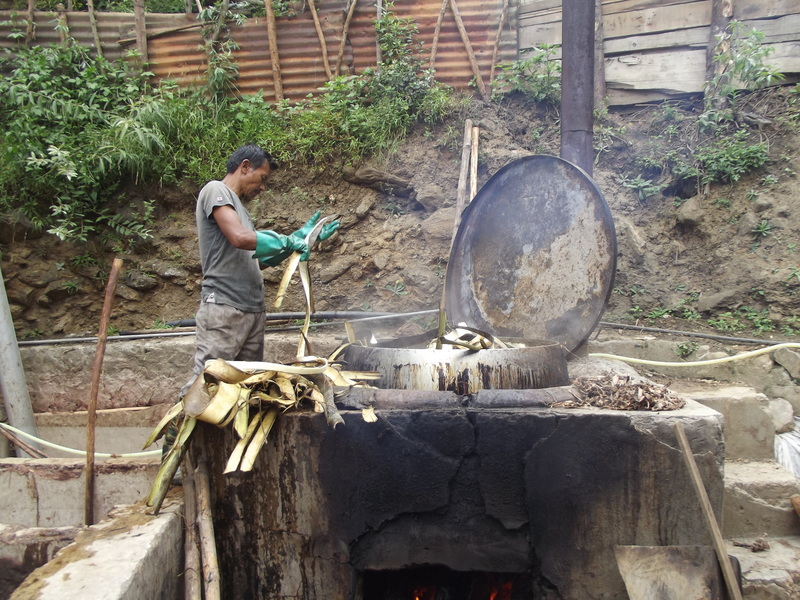 Making paper is a laborious process – first the plants are stripped and boiled in a huge vat. 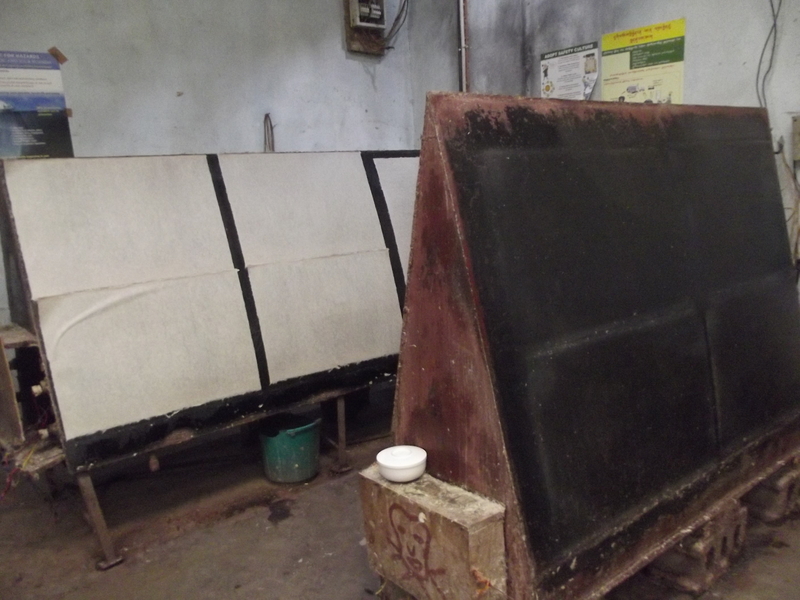 The pulp is washed, pressed and dried, and then the paper is made. 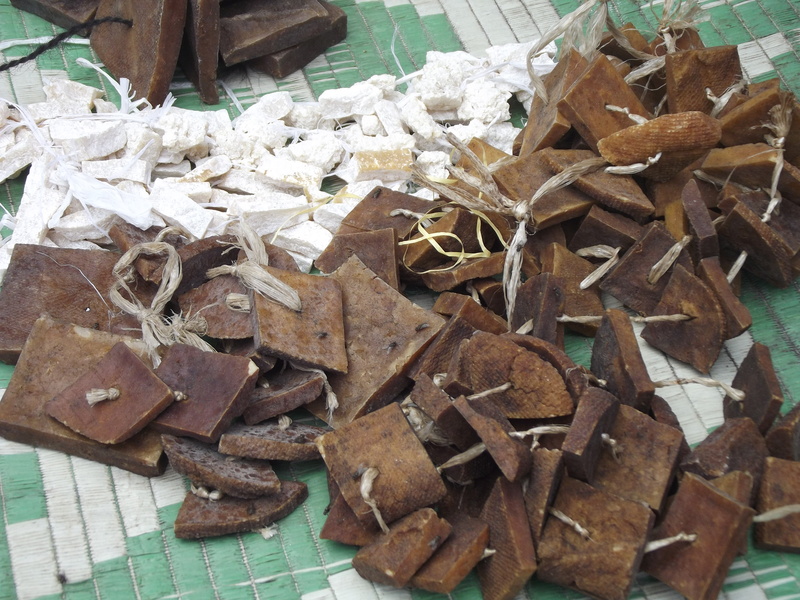 The smell is something you have to experience to believe. The end product is worth it though. I found the way they dry the paper on huge electric heaters interesting, as I’ve only seen it dried in the sun in Kathmandu (think of a big washing line). The National Textile Museum was a lovely place to see. 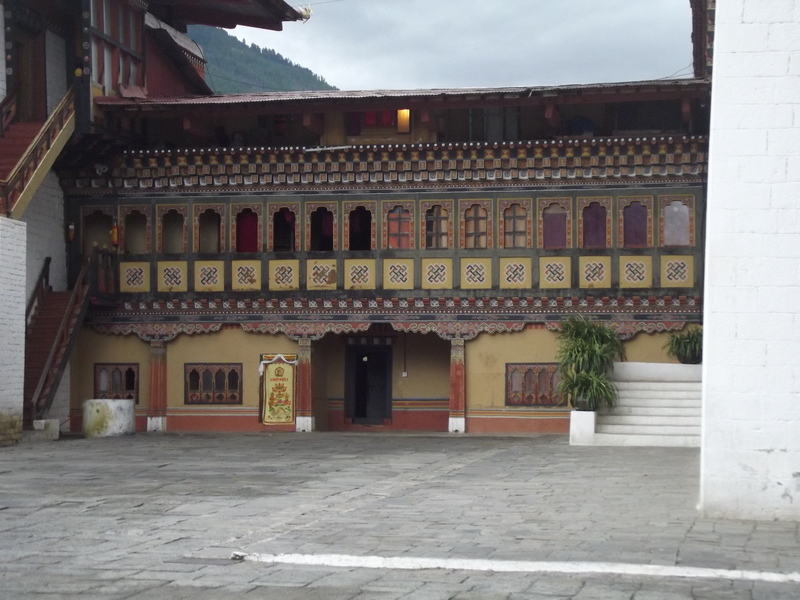 In the first toom I watched a DVD which explained the different types of weaving and how different ethnic groups in Bhutan make different types of cloth. 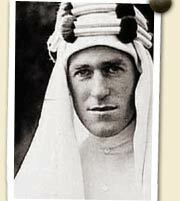 There are then two main rooms of exhibits: one contains clothes that the royal family have worn, for example at weddings, along with some of the history, and the other was a more general display of traditional clothes and jewellery. This was all beautifully presented and if you have even a vague interest in textiles, I would recommend a visit. 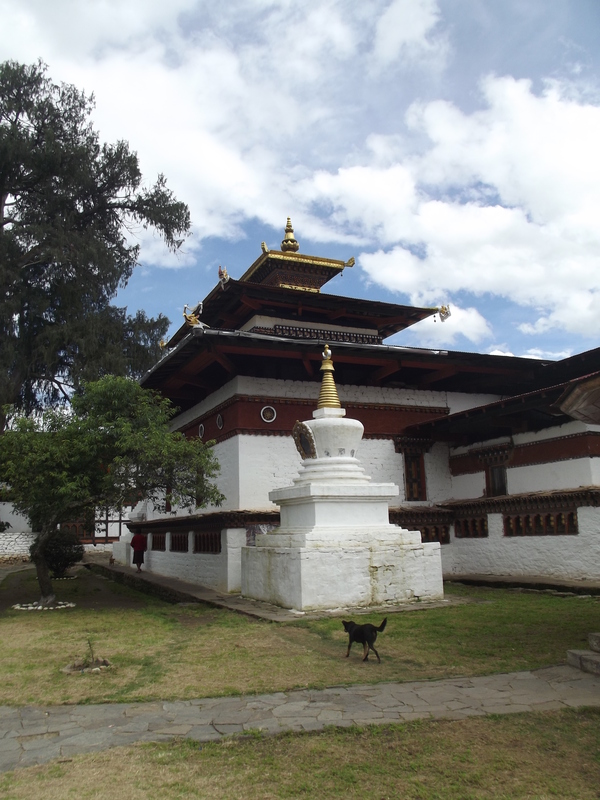 The last stop on my full itinerary today was the Trashi Chhoe Dzong, which contains the government offices and also houses some monks. It is only open for an hour or so in the evening, once the civil servants have gone home, but it’s worth the wait. 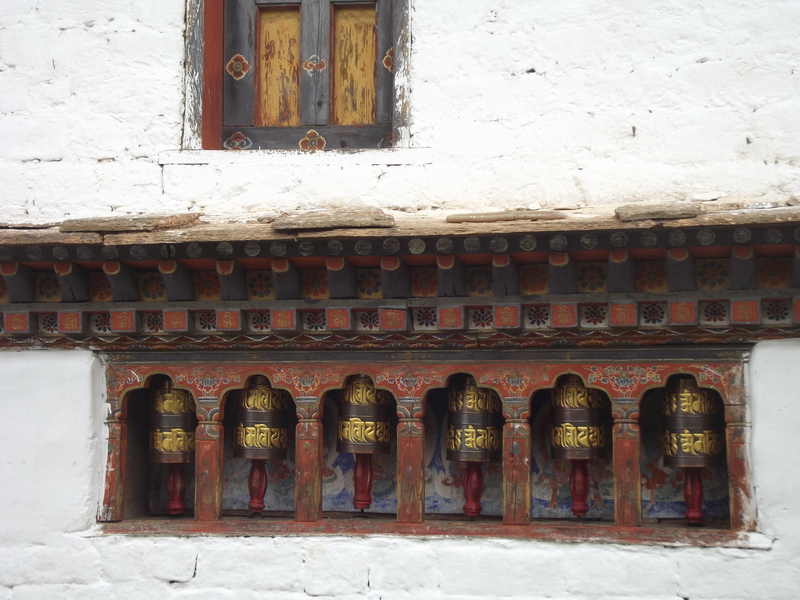 The buildings are atmospheric, with monks wandering around, and the sound of horns and chanting coming from the rooms on the first floor. 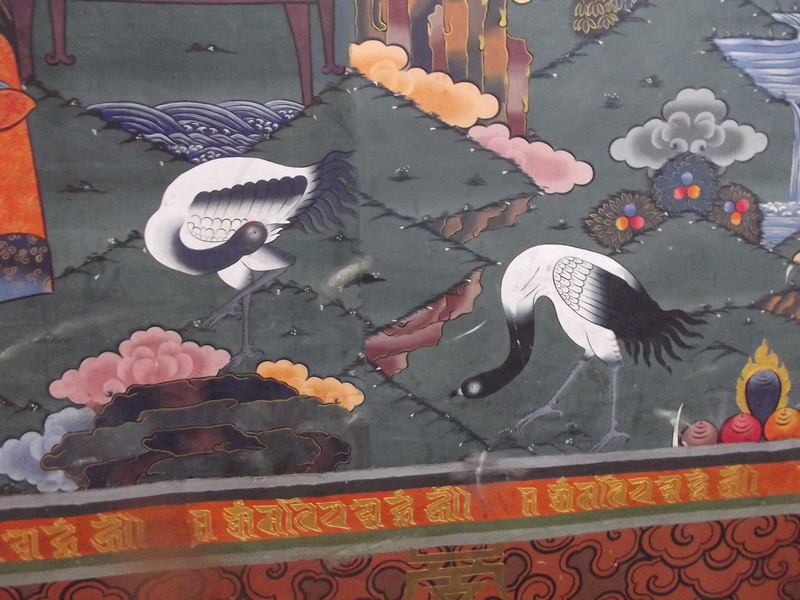 The rooms are painted with lovely murals and one of them is lined with small golden statues of the Buddha.